We’d like to thank Greg Dunning for sharing this story. I’m hoping that my Bill Murray story will be the earliest of all-time (probably won’t be but here we go). My father, John Dunning, was developing a kids movie, in 1978, originally titled Summer Camp. My sister and I (13 and 15 years old, respectively), along with my cousins always watched SNL on Saturday nights. By far our favorite regular was Bill Murray. Todd Dilamuca, Nick Rails, Nick Summers, Nick “insert your noun here” nightclub singer, and Celebrity Corner were what we waited to see. So when my dad asked us (his target demographic) if we would go see a movie if Bill Murray was in it, well… we went crazy. 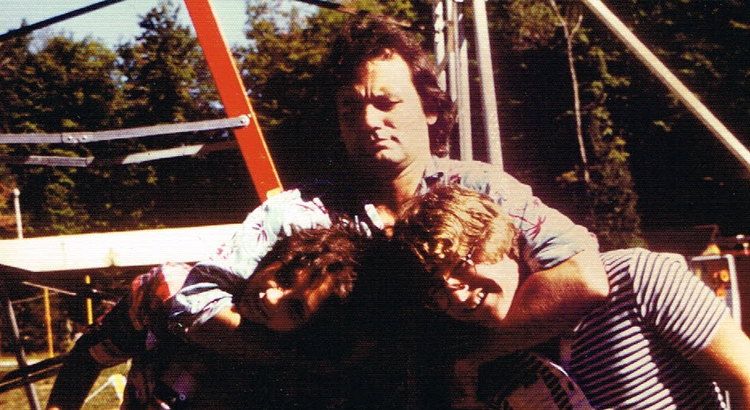 Fast forward one year and, thanks to Ivan Reitman (who was working with my Dad’s film company, Cinepix), Bill Murray was cast for the film – which was ultimately re-titled Meatballs. All we wanted to do was meet Bill Murray, so we bugged my dad relentlessly until he couldn’t take it anymore. And so, when he drove to Haliburton, Ontario, we came along to visit the set. Christmas in July! Once on set, we saw him goofin’ around just like on he does on TV with Lisa Loopner. We are in awe. My dad just said, “well go over and introduce yourselves”. Bill asked us our names and what we were doing here. We just mumbled answers with stars in our eyes. Really, all I wanted were some prom noogies from Bill Murray. Then he asked us, “You got any change on ya?” We said no, to which he replied, “Ya right!”, picked both of us up, turned us upside-down, and shook all the dimes, nickels, and pennies out of our pockets – putting them in his shorts. My dad said we should pose for a picture with Bill and of course, he obliged, but not without suggesting that we try to stand on his knees and pretend we are water-skiing in the shot. After all that personal attention, Bill actually had to get back to work. About month later, I got an envelope in the mail, with a personally signed photo of the wild man himself. Thanks a million for that that unforgettable day Bill! My friends never believed me until I produced the photos.